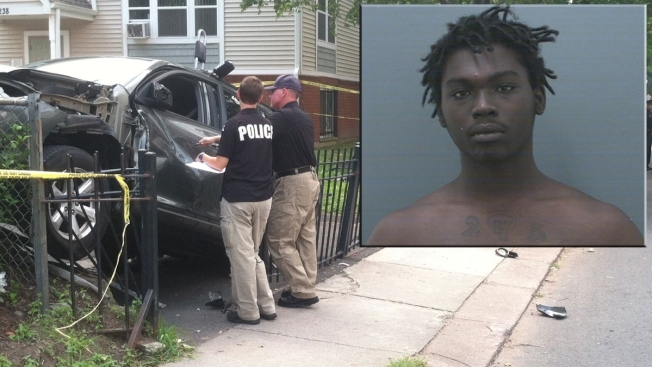 A woman suffered fatal injuries and a man was also hurt when SUV came barreling onto the sidewalk on Ashley Street in Hartford on July 18. Eighteen-year-old Deykevious Russaw (inset) faces charges in the case. The death of a Hartford woman who lost both legs after being hit by an SUV full of teenagers on July 18 has been ruled a homicide, the Office of Chief Medical Examiner (OCME). On Sunday, a teenager, Deykevious Russaw was charged in the crash with first-degree assault, second-degree larceny, evading responsibility, reckless driving and operating without a license. More charges are pending. Family members said 56-year-old Rosella Shuler died Saturday night. Shuler lost both of her legs when she was hit by Toyota Highlander full of teenagers while she was standing on the sidewalk on Ashley Street in Hartford. A man who was standing on the sidewalk was also hurt. Police believe six teens were in the Toyota, which was stolen out of West Hartford, but they all fled the scene of the crash. Through surveillance video, police identified the person behind the wheel as 18-year-old Russaw. Russaw was already behind bars on an unrelated case and because he was juvenile at the time, police will not release the circumstances surrounding that arrest. But sources close to the investigation said the teenager was one of two teens arrested for the shooting death of 63-year-old Jeffrey Worrel, of Hartford, on July 16 in the Westland Street area. He faces a murder charge in that case, according to the sources. The OCMe found that Shuler sustained blunt injuries to the trunk and lower extremities.